Encinitas | North County San Diego Area Real Estate :: eXp Realty of California Inc.
Encinitas is one of the most well-known North County coastal towns. With a reputation of being very laid back, Encinitas is a beach community with a strong surf culture, great beaches and an historic downtown area with lots of local shops and eateries. With a population of just under 60,000, Encinitas is 25 miles north of downtown San Diego and about 95 miles south of Los Angeles. With beautiful beaches and well-known surf spots, Encinitas is a popular destination for both local and tourists. Encinitas has a very mild Mediterranean climate with an average daily high temperature of 72°F. It sits along the rugged coastline and the city itself is divided into two areas – Old Encinitas and New Encinitas. Encinitas has a lot of history. You will still find several historic buildings in Encinitas, which date back to the late 1800s and the Mission and Rancho Eras. 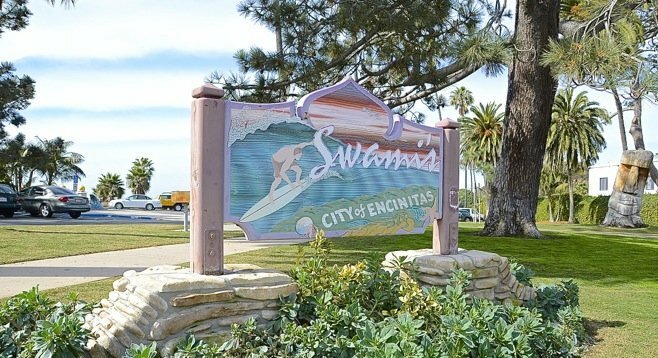 Encinitas is also the home of Swami’s Beach, Moonlight Beach, the San Diego Botanic Garden and the Self Realization Fellowship. West of the I-5 and along the beach and Highway 101, Encinitas is everything you would imagine a surf town to be. As you move east of the I-5, you find what is known as New Encinitas. This area still has the laid-back feel of Encinitas, but offers more of a suburban lifestyle with newer homes and shopping centers. This part of Encinitas has historically been known for its flower fields and produce. Today, many new developments sit on top of land that was once primarily used for flower growing. You can’t talk about Encinitas without mentioning Moonlight Beach and Swami’s Beach. These two breathtaking beaches are iconic and are very popular among both locals and visitors. 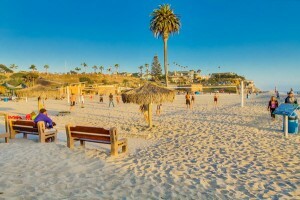 At Moonlight Beach, you will find picnic tables, volleyball courts, restaurants, a playground and more. All year, people gather here to enjoy the surf, the sand and the fire rings. Encinitas has plenty of parks for soccer, baseball, basketball, tennis and any number of recreational activities. It’s also home to the San Diego Botanic Garden, Batiquitos Lagoon and the Encinitas Ranch Golf Course. Old Encinitas is a great place to spend an afternoon walking or riding your bike. There are all sorts of local cafes, surf shops, and things to see that you won’t see anywhere else. In fact, it would take a LONG time to see and try it all. You’ll never be bored in Encinitas. This part of Encinitas also hosts several popular festivals and street fairs every year. New Encinitas is home to lots of restaurants, stores and businesses. This area of town offers the larger retailers and chains. From medical offices to groceries, home goods, home improvement and sporting goods, you’ll find it all in the Encinitas Ranch Town Center. Encinitas is served by the Encinitas Unified Elementary School District and the San Dieguito Union High School District. There nine K-6th grade elementary schools in the district including a special education pre-school program. All nine schools have been recognized as California Distinguished Schools by the California Department of Education and four have been named National Blue Ribbon Schools by the U. S. Department of Education. After elementary school, most students attend Dieguea±o Middle School, Canyon Crest Middle School and Oak Crest Middle. From there, they go on to attend La Costa Canyon High School or San Dieguito High School Academy. Private schools in the area include Encinitas Country Day School, Grauer School, Saint John, Sanderling Waldorf School, Rancho Encinitas Academy and The Rhoades School. Encinitas is also full of a variety of extracurricular activities like dance studios, martial arts studios and surf schools. Whatever your interest, you will find lots of options in Encinitas to explore and learn. Whatever you are looking for a walkable downtown district, ocean views, golf course views, there are lots of different styles available in Encinitas. The coastal communities of Encinitas have that surf town feeling with beach bungalows and cottages. As you move east, you discover newer suburban homes. Whichever part of Encinitas you live in, you have easy access to both small town living and the convenience of city-dwellers.